I am afraid, generally, I am retired from work, and because I am not forced to walk at work, I know my body is falling to pieces. It is just a matter of time until I cannot walk. I need to employ myself in some activity that forces my body to exercise. My body needs a job, my mind is overactive, and the body is on standstill. I have completed control of my time and life, maybe this is the problem. However, I already know, everyone my own age is older than I am. I just need to look around me and I know, they do not know the solution to this problem. I can see nobody is listening to this advice and staying in shape. I am parts of a group who slowly are giving up walking. I know one solution, I can quit travel, then I could return to my daily routine of going to the gym in the USA, looking at girls in tights, chatting, and working out. I like doing this; it was not difficult to keep motivated. In the 12 years of travel, I have never found an enjoyable way of exercising truly kept my body tone, overall body in shape. I can only be in the USA for 30 days, because of Taxes, I am thinking of going to Canada a couple times per years. Canada is the same as the USA, not a lick of difference… I search for gyms in all the Expat hangouts, they are overpriced jokes. I walk a lot, this is not the problem. I need to use all the muscles groups. When I look at my new Expat Retired friends here in Sosua, Dominican Republic, I get depressed. I can see the different age groups and nobody is fighting it, we are all going down the tubes. 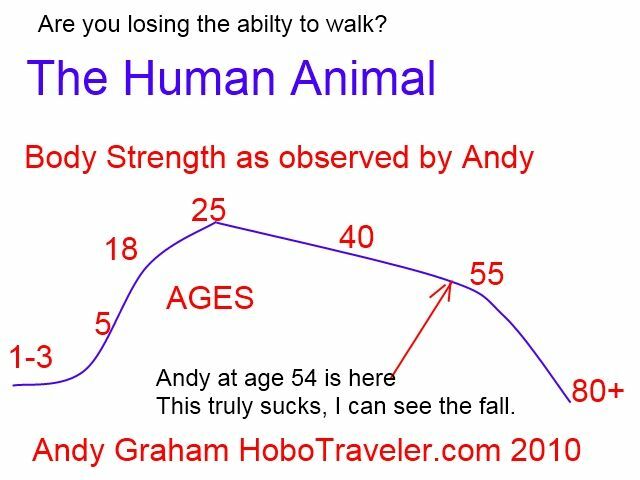 I think the human animal physically peaks around age 20-25, the slowly atrophies until around age 65-80 we lose the ability to walk. It is not an event, it is a process, and I know I am losing the ability to walk. I know one thing, the more I define the problem, the closer I am to a solution. I hate to say it, but I need to find some 20-25 year old people to hang out with, I want to get back on the other side of the that hill. Are you too busy to contemplate this problem? I know the majority of my friends are on a hopeless treadmill, their lives are consumed, they do not have the time to read this, halfway contemplate solutions. Please do not tell me to exercise, tell me what motivate you to exercise. Mom- For Pete's sake Andy, I am 76 and your dad is 77 and we walk everywhere. You probably need to swim when you get the chance, get a fresh suntan, rent a bicycle, take lots of short walks throughout the day and who knows perhaps you might be able to run in a marathon if you traveled to the right place. Your Grandpa Graham was 92 when he died. He was still a walker even in the nursing home where everyone chuckled when he took his lady friend to the entertainment room to dance and bowl. Your body is made of a strong constitution and you come from ancestors who lived to be really old and healthy. Stop fussing. 1. Making friends with people under 30. 2. Finding some sports I like. 3. Change countries less, so I can work into my travels exercises..
4. Go the beach areas more. I am doing some very specific muscle exercises that help. People I am not worried, I just backpacked through Haiti for two months. The 20-30 group seem incapable of doing this, I should slow down and allow them to catch up. I am aware though, my body is working against me, and walking long distances is required to be a traveler. giggle @ what Mom said............ Just like a Mom, stop whining and go outside and play. I'm a few years older than you and I ride a bike daily. The ankles can't take the long walks needed to do any good. I believe the boomers will be the last generation to look good in old age. Remember when we played outside all day? I read that 1 in 4 children now are already obese!